On September 12, 1952, a strange being from outer space may have visited the small town of Flatwoods, West Virginia, in the United States. On that night, many strange lights and shapes were reportedly seen in the skies all over the country... but in Flatwoods, one of these lights appeared to land. Six boys, with ages ranging from 10-17, saw what “looked like a silver dollar rushing through the sky” approach a hill and seemingly land on the other side. Two of the boys, Eddie and Freddie May, lived near the hill so they told their mother about the object. Around seven at night, all six boys, Mrs. Kathleen May (Eddie and Freddie’s mother), and the oldest boy’s dog set out with a flashlight to investigate. The two oldest boys, Gene Lemon and Neil Nunley, led the way. The top of the hill glowed with a red light that slowly pulsed from dim to bright. They encountered a strange fog that smelled foul and made their eyes sting a little. From the hilltop, the group could see a strange object about fifty feet down the hill ― a glowing red ball as big as a house ― when Mrs. May noticed two small lights to the left of them. One of the older boys turned his flashlight towards the small lights. Standing just fifteen feet away from the party was an unknown creature. It was humanoid, around ten feet tall, and had a round, blood-red face surrounded by a dark pointed hood, shaped like an ace of spades. The face had eye-like openings from which projected greenish-orange beams of light. Its upper body appeared to be wearing clothing of some sort, but it was hard to determine in the brief moment it was seen if the figure had arms, and no one saw what it looked like from the waist down. The creature approached, seemingly gliding rather than walking. Lemon fainted. The others grabbed him and ran, and didn’t stop until they reached the Mays’ house at the bottom of the hill. By the time the sheriff came to investigate, the monster and the glowing ball were both gone. Interviewed separately, the witnesses’ stories agreed on the important details; so, although many didn’t believe the story, all had to agree that the group had seen something on that hill... something that had terrified them. Since that night, many people have investigated the event. One study done fifty years after the occurrence led investigator Joe Nickell to believe the boys and Mrs. May mistook a meteor that flew over the town for an object that was landing, and that their own sense of fear and expectation of a possible alien spacecraft made them think they saw something extraterrestrial. There was a natural fog, carrying the smell of local onion grass, and a flashing red airplane beacon, followed by a barn owl flying at them... and, expecting a monster from outer space, he believes the group panicked and ran before they could grasp what they had actually encountered. Other people feel there is much more yet to be discovered about this strange encounter. For example, investigators in 1953 found a young woman and her mother who had seen a similar creature in Weston, 11 miles away from Flatwoods, a week earlier than the Flatwoods encounter. This creature also emitted a strange odor. The young woman was so traumatized that she was confined in the Clarksburg Hospital for three weeks. Whether the group in Flatwoods met a monster or not, their encounter report was exactly the sort of story that was expected to happen by the space-crazed American public of the time. Because of this, the story of the "Flatwoods monster" was readily accepted by many people and so remains an actively investigated mystery today. “The Monster and the Saucer,” by Gray Barker, in FATE magazine, January 1953, no. 34, USA. Pgs. 12-17. This article has been reprinted, and is online: Click here! “More on the ‘Green Monster’,” article in Civilian Saucer Investigation, Vol. 1, No. 2, Winter 1953. Los Angeles, California, USA. Online: Click here! 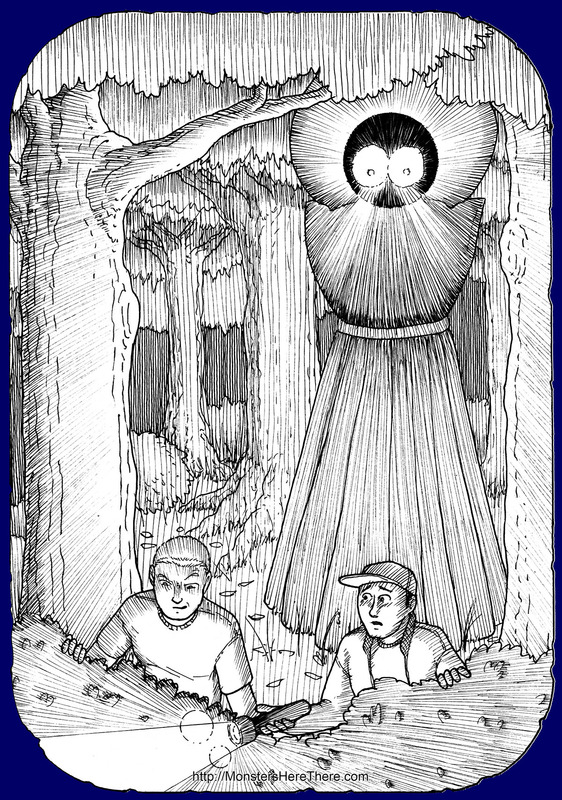 "The Flatwoods UFO Monster," chapter in The Real X-Files: investigating the paranormal, by Joe Nickell, 2001 University Press of Kentucky, ISBN 0813122104, 9780813122106. Pgs. 301-311. Online [partial preview]: Click here! Unexplained!, by Jerome Clark, 1993 Visible Ink Press, Detroit, MI, USA. ISBN: 0-8103-9436-7. Pgs.135-136.